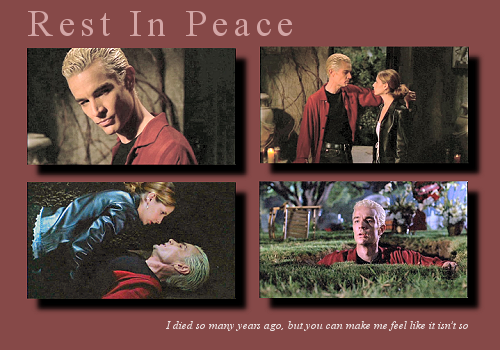 This is the fanlisting for the song sung by James Marsters character, Spike, (Buffy the Vampire Slayer) Rest In Peace, listed with The Fanlistings Network, under the Songs: Various category. If you're a fan of Rest In Peace, which aired during the episode, Once More, With Feeling, please feel free to join! If you have a personal website, please link back to this fanlisting, so that other fans can find us too. Sonya of Fanique - 2011. This website was made by a fan, is non-profit and is not official, in any way. The pictures used were screencapped, but do not belong to me, and no copyright infringement is intended. Please contact me with any concerns you may have.